Tropical Cyclone Winston evolves into mid-latitude low. Visible satellite image of former Tropical Cyclone Winston at 12.30pm today (Thursday 25thFebruary). As Winston crossed latitude 25 south early this morning, MetService New Zealand’s Tropical Cyclone Warning Centre (TCWC) took over responsibility from the Fiji Meteorological Service for issuing all official advisories and bulletins about TC Winston. At 7am this morning Tropical Cyclone (TC) Winston was located near 25.3.1S 172.1E lying well southeast of New Caledonia and about 350km northeast of Norfolk Island (Thursday 25th February). TC Winston was reclassified at a mid-latitude low around midday today after 14 days as a tropical cyclone and crossing Fiji as a category 5 cyclone. The low that was Winston was located near 25.5S 171.4E this afternoon or about 280nm (510km) northeast of Norfolk Island and moving southwest at about 10kt (18km). It is expected to pass about 115nm to the north-northwest of Norfolk Island around midnight tonight. Easterly gales associated to former TC Winston is expected to affect Norfolk Island from this evening and ease tomorrow morning as the former TC Winston moves away to the west-northwest. “The low which was formally TC Winston is expected to pass north of Norfolk Island overnight, then to track westward towards the mid-Tasman Sea, where it could possibly re-intensify. “If the low intensifies enough to be tropical cyclone again, it will retain its name, Winston," said Communications Meteorologist Lisa Murray. Historical track of TC WInston (in white) plotted by MetService using WeatherScape. 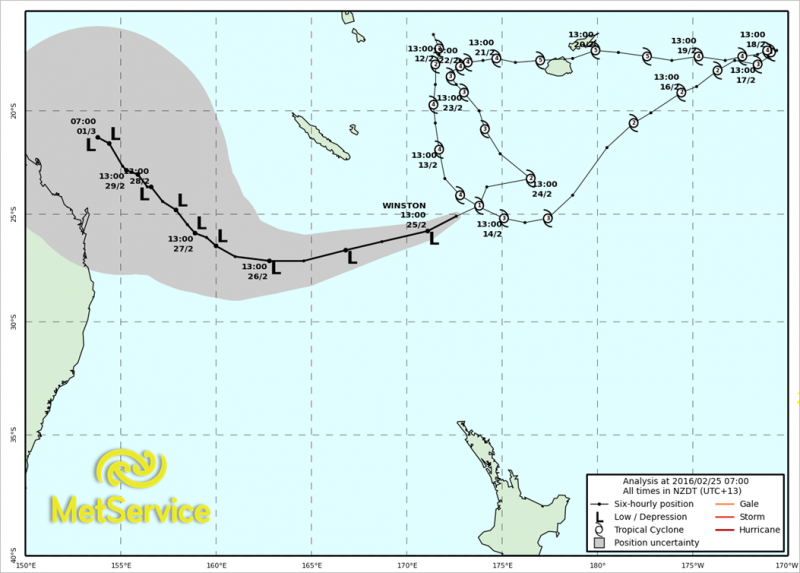 Forecast track for former TC Winston (now a low) from MetService, New Zealand. Looking at a range of global weather models, most are keen to move TC Winston across the Tasman and towards the Coral Sea, although a few still indicate tracks towards New Zealand late this weekend or early next week. “The risk of this low then tracking across or directly impacting New Zealand is diminishing day by day,” said Lisa Murray from MetService. Range of possible future tracks for Ex-TC Winston and tropical low near Cook Islands, based on GEFS data. Image from NOAA Earth System Research Laboratory. Meanwhile, back in the tropics there is a tropical depression lying well northeast of Rarotonga, Cook Islands, which could potentially develop into a tropical cyclone in the next couple of days. This tropical depression (11F) (998hPa) was analysed near 18.6S 155.8W at 250000UTC. It sits over sea surface temperatures of 29 degrees and sits under an upper level anticyclone, so a weak sheer environment. All these ingrediance make it look likely that this low could develop into a tropical cyclone over the next 24 hours. Infrared satellite image of tropical depression near Cook Islands. Image from JMA satellite. The World Meteorological Organization (WMO) Tropical Cyclone Programme has been established to help emergency managers and the public prepare for tropical cyclones and minimise the loss of life and damage they can cause. Under this programme, MetService is designated as the Wellington Tropical Cyclone Warning Centre (TCWC) and, together with Regional Specialised Meteorological Centre (RSMC) Nadi, is responsible for official warnings and advisories for tropical cyclones in the South Pacific. As always, you can keep up to date with the latest forecasts and warnings at metservice.com as well as updates on the MetService Blog, Twitter and Facebook.